Netanyahu's Not-Quite-2-State Solution Days after President Trump endorsed a two-state solution, the Israeli prime minister tells NPR's Steve Inskeep that Israel must retain control of security in any agreement with the Palestinians. Israeli Prime Minister Benjamin Netanyahu applauds President Trump during a speech at the United Nations during the U.N. General Assembly on Thursday. President Trump's administration has begun pressing Israel to embrace the idea of a Palestinian state. Israeli Prime Minister Benjamin Netanyahu is insisting on something less. Netanyahu spoke with NPR after Trump spoke in favor of a two-state solution while visiting the United Nations last week. (To be precise, Trump welcomed a two-state solution, or a one-state solution in which Palestinians are absorbed into Israel: "If they do a single, if they do a double, I'm OK with it if they're both happy.") In the NPR interview, Israel's leader pushed for neither. Netanyahu said Israel must remain in complete control of security, whether Palestinians claim a state or not. Netanyahu, however, tells NPR he has made it clear for several years that any Palestinian government could not have full control of security. In May, Netanyahu praised Trump for his "courageous leadership" in pulling out of the 2015 Iran nuclear deal, something Israel had been fighting against since its formation. 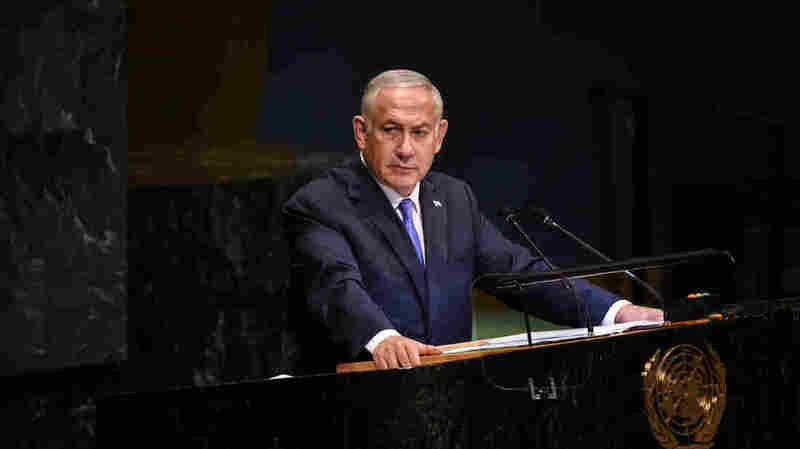 Netanyahu again commended Trump for standing up for Israel during the U.N. General Assembly meeting last week, when the Trump administration announced it would cut all funding to the U.N. Relief and Works Agency in Palestine. The agency helps fund schools and clinics in the West Bank and Gaza — as well as Jordan, Syria and Lebanon — for more than 5 million Palestinian refugees. "We value America's support from all sides," Netanyahu said.